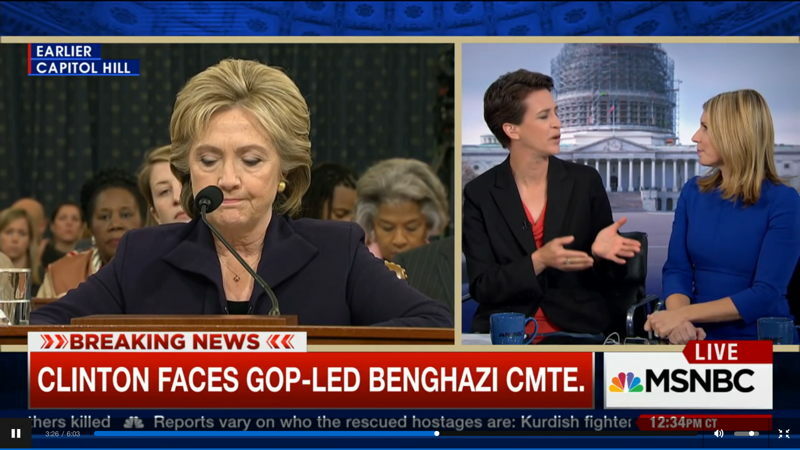 When the first break came in today’s Benghazi hearing, it was a real test for MSNBC’s alleged dedication to “hard news,” with its highly-touted albeit disgraced ex-NBC anchor Brian Williams at the helm. And what did viewers get? Pretty much what The Cable Gamer expected. Aside from brief bits of background from Andrea Mitchell and Kelly O’Donnell, the break between sessions was pretty much focused on comments from three of MSNBC’s lefty program hosts: Chris Matthews, Rachel Maddow, and Lawrence O’Donnell, along with “conservative” Nicole Wallace. The very existence of a nominal Republican on MSNBC’s airwaves is quite a development, even when she has to fight to get a word in edgewise with three opponents talking over her. Still, while this might be a typical panel for a remake of The Cycle or some other unbalanced MSNBC opinion-fest, it’s a joke for what’s supposed to be nonpartisan “hard news” coverage. Meanwhile, when MSNBC wasn’t pitting three partisan Democrats against one centrist Republican it found time to squeeze in a few additional interviews: committee member and Hillary defender Adam Schiff, committee member and Hillary defender Elijah Cummings, and from the State Department Joel Rubin, who gushed that Hillary’s testimony showed her to be “a giant among amateurs.” If this coverage leaned any further forward, Brian Williams would’ve been face down on the floor. MSNBC is painting its daytime news coverage as “nonpartisan.” The Cable Gamer rates that claim: Pants on Fire! How long will clueless, gullible media reporters keep parroting that line? See, I told my friends not to get too gleeful when Trey Gowdy pews the scrooch on this. Now they’ll pay the price. Had errands to run and just got home. I have yet to view (on my DVR) the MSNBC or FNC coverage during the break. Sounds like your saying MSNBC used partisans and FNC mostly used outside experts. Not good on MSNBC’s part. What I can comment on is the best and worst interrogators on the committee so far. Review: Oh my. What an embarrassment. His language skills were dreadful — e.g., saying “dis” and “dat” a lot instead of “this” and “that.” He also stammered a bit and seemed over his head at other times. I should add that Jim Jordan (R-OH) was also quite good in grilling HRC about why the suggestion (or false narrative) that the attack was a response to a video.